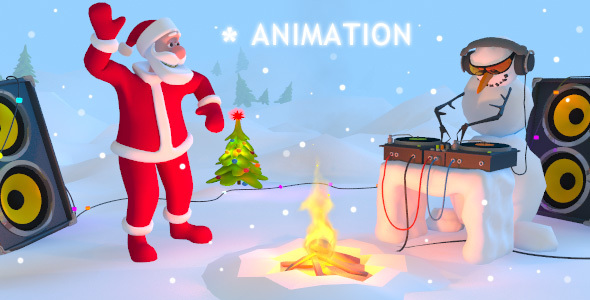 3D animation kit for creating greetings animations with several already animated characters. See complete movie here. You can purchase this model on 3DOcean. - Santa rigged and skinned with standart 3DS Max biped. Eyes blinking cycle with look-at constraint can animate by just target moving. - You can use own biped or keyframe animation for Santa. - Animated DJ Snowman with IK bones in hands and headphone’s cable. Animated acoustic system. - Animated jumpin’ tree with GI-generated toys. - Tuned fire created with FumeFX plugin and SuperSpray particles. - Fine tuned scene with camera and target motions along path, fog and light effects, animations timing, Vray render settings etc. - Easy merge any object with your own scene. - Archive also include original Flash CS3 (.fla) file with complete sounded movie with vector snow, preloader and start/stop buttons. - Sounded with original soundtrack (included wave 44100kHz/24bit).